Websites are always meant for the desktop or laptop screen, i.e., they can be viewed on the screens of desktop/laptop. As per the rapid growth of mobile phones with latest technologies, the user can bring the entire world into their hands with this pretty device. Nowadays, smartphones, tablets gives wide access to all the websites. For this, developers want to write the code for all the websites in both versions, that is – for desktop version and mobile version. This is because of the variations in the screen resolution found in those devices. If a website is a designed using CSS (Cascading Style Sheet), one simple code is quite enough as they offer gorgeous viewing experiences on diverse screen resolutions. Designing a layout and coding a website that results in finest viewing experience on a wide array of devices from desktops to mobile phones. It will fit all the screens regardless of the screen size and resolution. The layout will become accustomed to all the device screens – smartphones, tablets, desktop, laptop, smart TV, etc. Websites can be accessed only on the mobile devices. Some indirect platforms are used to redirect to the preferred site of the user. At most of the time, the sites may congregate on their own sub-domain. Though these mobile websites are easier and easy on the pocket to launch, they target the screens of phone-sized devices and the maintenance cost is too high. 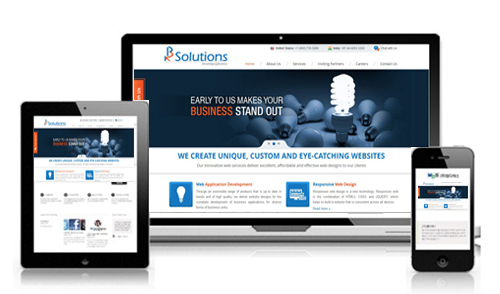 Responsive websites offers optimal viewing experience as it is loaded with the optimized markup feature. Apart from this attractive feature, it also includes pixel resolution, flash technology; click vs. touch, screen size and much more. Cascading Style Sheets (CSS) – a most attractive and the enabled feature in the responsive design websites. These style sheets make the users to enjoy different varieties of experiences. This also helps to keep the content of site as such as they are without any modifications. Google, the most popular search engine always favor this web design, as it gives real-time experience to all the new users. SEO and internet marketing can be simplified with these web designs. In the current industry, most of the marketing and sales reach people at a very fast rate through the mobile-friendly websites. As the usage increases, the trend in mobile technology also escalates. Above all, mobile internet usage is high when compared to the desktop. Mobile compatibility is good in responsive design websites. Flawless user experience across several devices helps in dealing with SEO strategies. One share can reach the mass audience to access the same content through different devices. Being a single code, managing and maintaining the sites are so easy. This makes you to stand out from all your competitors. Most of the companies want their company links/domains to be conserved always. Responsive design implants the new code on the backend of the websites. Centralized control – changes made at one place will reflect in all the websites and applications. Location-based services, news or media sites use these sites for the scrolling, zooming, resizing features. Blogs and corporate sites make use of these sites for handling large number of users at a time. Develop your websites using this responsive design, and get more greets from the end users to your business with its optimal viewing experience!! !